The ability of online retailers to deliver orders the same day that customers place those orders has changed the landscape of online grocery buying and the associated grocery supply chain. If the definition of an optimized supply chain is a supply chain that helps a retailer deliver what a customer wants, when that customer wants it—and spend as little money as possible getting that done—well then, online grocery selling might be close to sticking the landing. Amazon has a distinct advantage when luring customers to the online grocery buying experience. Nearly all new online grocery buyers have had experience buying other goods online. And Amazon practically owns that little corner of the internet—online shopping. Therefore, it's an easy transition for online shoppers from buying toothpaste online to buying bread online. Amazon offers the convenience of a broad assortment of products, combined with the familiarity of use of its customer base. Amazon Prime customers can also take advantage of free shipping on eligible products. FreshDirect, Thrive Market and other specialty eTailers don't try to compete with Amazon in terms of breadth of product offering. These specialty eTailers offer organic, gluten-free, locally sourced or other specific items, which can give the online shopper the feel of browsing a smaller grocer as opposed to one the size of an entire online universe. Walmart and other supermarket chains have doubled down on entering the online grocery shopping market space. Walmart's (and supermarkets') ubiquity are an advantage that they've learned to capitalize on. Online grocery shoppers can order and those orders can ship from local brick and mortar stores. The proximity of the shipping locations gives Walmart and other brick and mortars a good chance to make same day deliveries. Cost can be measured in dollars, time and convenience. Amazon's enormity allows it to offer lower pricing—for grocery and non-grocery items. Walmart and the other brick and mortar stores may not be able to compete on a pure dollar-for-dollar basis with Amazon, but they can offer the convenience of having customers feel like they're shopping at their local store. Specialty eTailers aren't usually competing on a dollar-for-dollar basis with Amazon, either. Their competitive advantage is its unique product offering. Websites and apps designed to make the grocery buying experience more and more convenient are getting more and more sophisticated. With just a few clicks, you can buy almost any grocery item online. So when you're trying to decide which of the online grocery buying options is the most convenient, you're options only differ by a matter of degrees. Amazon's convenience can't be overstated since you can buy your grocery item and your sneakers in a single click. But if you're focused on a specialty item (organic, gluten-free, etc. ), FreshDirect or Thrive Market might be more convenient. 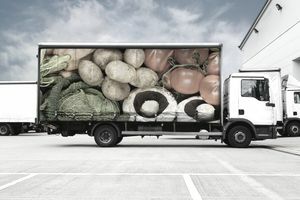 An optimized supply chain behind the grocery buying experience can be the difference maker, when it comes to a customer's perception of convenience. Local brick and mortar stores who offer online grocery delivery have a supply chain advantage. Their inventory is already deployed near their customers. Online sellers with no local brick and mortar stores are faced with the dilemma of paying for customer delivery from farther away. Amazon has conquered that dilemma and Amazon Prime members enjoy free delivery on many items. Amazon's reliability also extends to its customer service (where wrong deliveries or damaged goods are routinely credited to the customer without the parts needing to be returned). Online grocery buying has revolutionized food supply chain by creating a demand for end-consumer delivery of perishable goods. Local brick and mortars may be able to seize upon this market opportunity but they may not be able to compete with the global footprint of Amazon.